The Paw Print Kitchen started when we adopted our first dog, Elliott. Like most pet parents we wanted all the best toys, food and treats for him. But after doing some research, I was stocked to find out that MOST store bought treats are not made with the best quality ingredients! So with my background in Culinary Arts, I started baking and cooking for him. 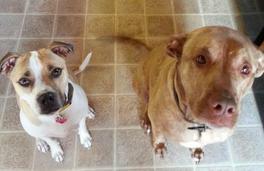 In 2007 when the big Pet Food Recall hit, I really got serious! Not only did I want good quality treats for Elliott but for all dogs. It took some trial and error, but with Elliott more then willing to sample anything I made him, we finally can up with the perfect recipes for our treats! 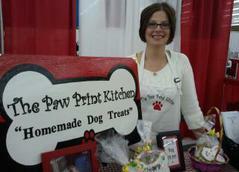 In 2009 we registered our treats with the Ohio Department of Agriculture and opened The Paw Print Kitchen! Because of my background in Culinary Arts (I have 3 Culinary Degrees) the quality of ingredient is VERY important to me. All our treats are made with fresh wholesome ingredients, and NEVER frozen. They are made fresh when you place your order. We DO NOT have treats just sitting on the shelf waiting. The flavors are from real ingredients, not imitation flavoring. We only use good quality Whole Wheat Flour. Plus, there are no salt, sugars, additives or preservatives in any of our treats.